Eastern Scotland often gets a bad reputation for breeding far too many bands whose CDs enjoy long lives as makeshift paperweights, and whose live shows are ten years too late. Dead Sea Souls are not one of those bands. 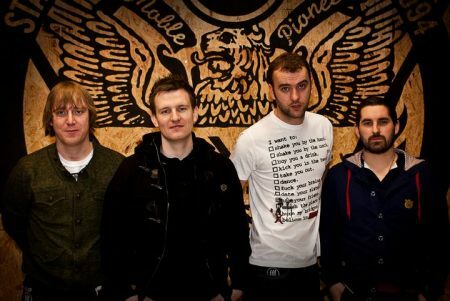 Intent on bringing enjoyment and energy back to Scottish music are these four West Lothian lads. BIG PETER: Tell us a little about where you’re from, please. DSS: We’re all from around the Bathgate area in central Scotland. Whitburn, Stoneyburn and Longridge. They are all small mining villages - Longridge only has a handful of streets! We’re really proud of where we all grow up; too many people are quick to play down their small town origins. We tend to think that where we are (smack-bang in the middle of the central belt!) gives us access to just about any major city in Scotland and some in England. I mean, we are 30 minutes outside Edinburgh, which is handy because it is where most of our fanbase is! BIG PETER: Why is the band so called? DSS: It’s basically a play on the Dead Sea Scrolls. Colin from the band was fascinated with the idea of them when he was a teenager. Incorporating the word “souls” was probably just convenience, but we like to think we make songs with a bit of soul so I suppose it’s quite appropriate! BIG PETER: What bands/artists have had the greatest influence on the band? DSS: Definitely one of the hardest questions to be asked as a musician who writes music! I suppose in terms of the groove we try to generate there’s a variety. We love proper disco music; the kind of stuff that gets sampled in modern dance music. Chic are a massive influence, the song ‘Everybody Dance’ is a disco-funk masterpiece! Also Ska is important for us, artists like The Specials, Toots &The Maytals and early Madness help to shape our beats. Ian Dury and the Blockheads also have a lot to answer for as well as are Orange Juice and Postcard Records in general! In terms of the songwriting there’s modern stuff like the Courteneers, Arctic Monkeys - observational stuff. And of course the old favourites like REM and Ocean Colour Scene. We have a lot of respect for newer bands like The Sunshine Underground, Two Door Cinema Club, Vampire Weekend and so on, too. BIG PETER: You’ve been gigging pretty solidly over the past few years. Now it seems that you’re getting airplay in the US. It must be nice to find that the hard work is paying off? DSS: Yeah, definitely. We were chuffed with the airplay over the pond. We have a growing fanbase over there which is really exciting. Feels like the groundwork for the last few years gigging and writing is starting to come good and we’re ready for it now. BIG PETER: There’s also a new EP, “Faces”, that was recently released. Are you looking at recording a full-length album anytime soon? DSS: We’ve already started recording our first full length album. It’s really exciting and we’re almost halfway there! It’s a good mixture of songs which we have toured for a while and brand new tunes that the fans won’t have heard yet. We’ll be ready to launch it in late 2011, and we intend to tour around the same time and have some big shows in the pipeline to support it. Next to playing live, recording is kinda the goal of being a band. To record an album that can listen to in 10, 20 or even 30 years and say, ‘yeah I’m proud of that.’ We think we’re well on the way to achieving that. BIG PETER: What can concert-goers expect from your shows? DSS: Energy. We come off stage drenched, hoarse and totally knackered!! Someone said recently, "you guys play every show like it’s a farewell gig!" It made us laugh but it’s true, we make a big deal of every show! It sounds like a cliché but the fact is that we are always genuinely surprised when so many people turn up to our gigs. It’s an incredible high, nothing like it! First and foremost we make music for people to dance to. So girls, wear flats, and guys, leave the new Prada shoes in the house - they won’t survive! BIG PETER: Where can people buy your music? DSS: We’re available on every major download site. iTunes, Amazon, Bandcamp, et cetera. You can also pick up physical copies on sale at all our shows. If you want to keep involved though, join the Facebook site; it’s growing constantly and you can listen to tracks there! BIG PETER: Thank you for your time!